Order Your Property Specific Hail Report Today! Do you need a custom hail report for your home or business? Well, you have come to the right place! Our hail reports provide you with address specific hail storm details like the hail size, the time the hail hit, the storm’s direction, and how long the hail lasted. 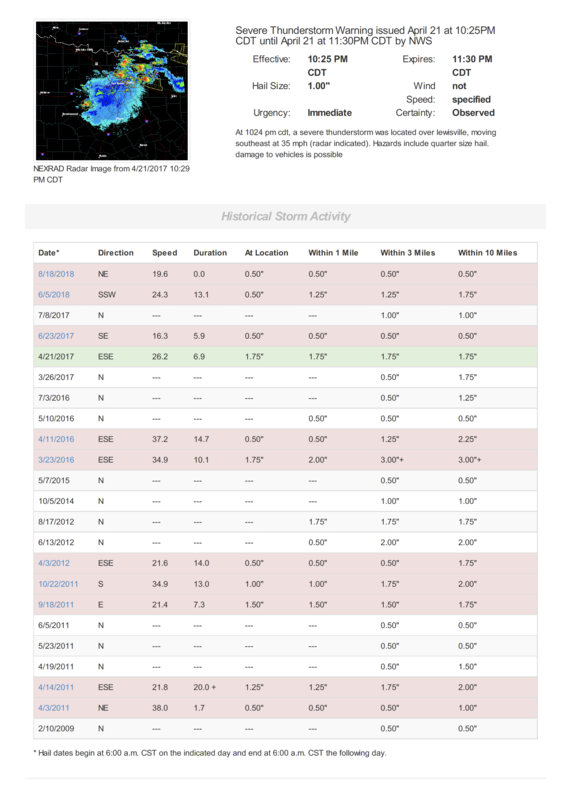 We also include any severe weather warnings that were issued at the time. Severe weather warnings provide you with additional proof that there was severe weather and hail in your area on the date of the report. You are about to purchase the most comprehensive Hail Impact Report available. Interactive Hail Maps is a weather reporting service that provides comprehensive hail data to insurance companies, insurance adjusters, general contractors, and paintless dent repair companies nationwide. Our comprehensive Hail Impact Reports are available individually, to the public through this page. The reports are emailed to you in PDF format. Don't worry, hail storms happen all the time and insurance companies are constantly dealing with hail damage claims like yours. However, there is usually a time limit between the time the damage occurred and the date you can file a claim. Most states have a 2 year time limit but there are some states that won't let you file a hail damage claim when the damage occurred over 1 year ago! Because of this time limit your insurance company needs some kind of documented proof showing them when the hail storm hit. That is where Interactive Hail Maps comes in! We are the leader in comprehensive hail data and we provide you with that proof. We help you verify your contractor’s claim that you have hail storm damage and that your damage occurred in the last 2 years! Our Hail Impact Report is the strongest piece of information that you can present! How Fast Do I Get It? 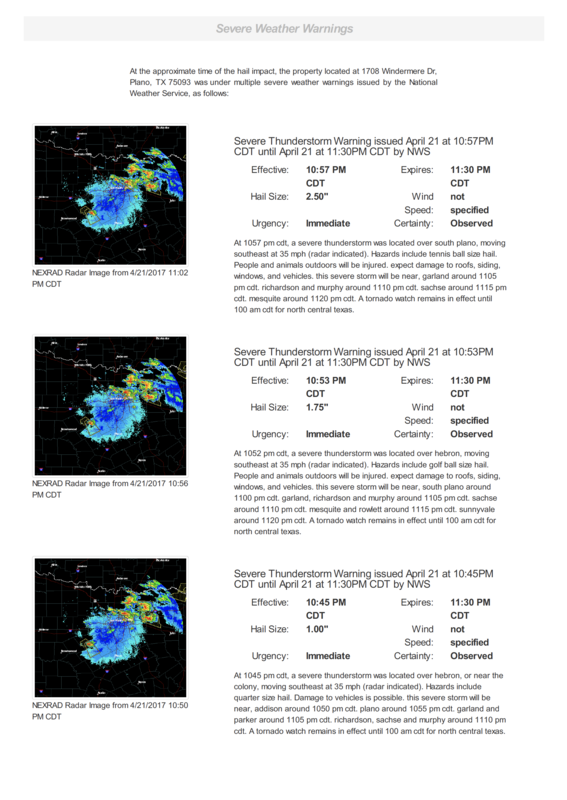 The Hail Impact Report will be emailed to you in PDF format where you can easily view on your computer and print it out. 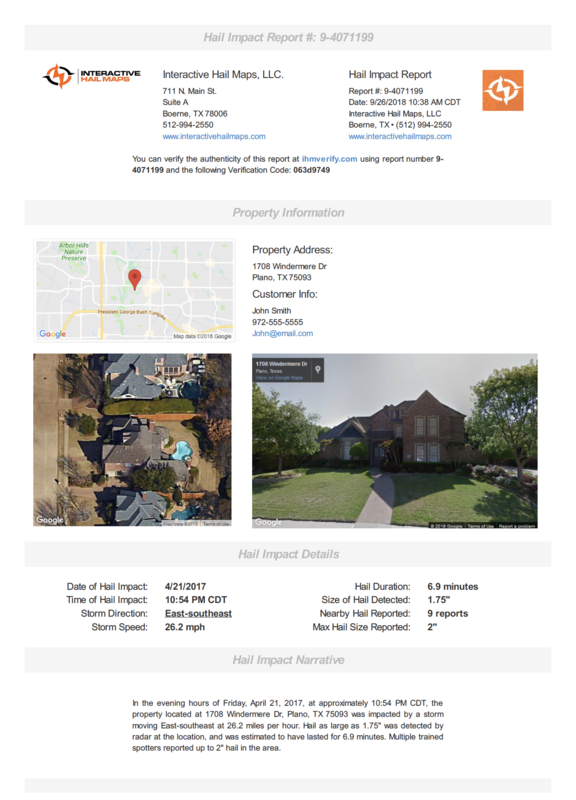 $39 for the comprehensive, property specific Hail Impact Report – paid by credit card. This report doesn’t require that you have our hail mapping subscription. It’s just a one time payment of $39. After you fill out and submit your information in the form below we will call you within 1 hour. (during business hours 8-5 central time). We will discuss with you your situation, get your payment information, create the report, and email it to you. Sorry that purchasing your Hail Impact Report isn’t an automated process but we are working to fix that! Until then, please fill out the form below and we will call you within an hour to get details regarding your report needs. We will then email you the report within minutes of that phone call! Our business hours are 8:00 am to 5:00 pm weekdays but we will call you asap even after hours!